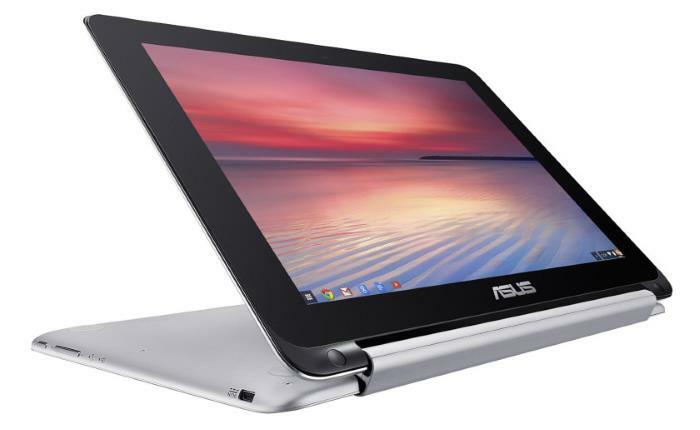 Back in April, Asus unveiled the impressive Chromebook Flip, a 2-in-1 Hybrid PC which can also be used a tablet on-the-go. If you’re thinking about getting your hands on the Asus Chromebook Flip, you be glad to know it’s now available in the US for $249 from Asus, Amazon and Newegg. The hybrid machine offers a decent set of specifications, including a 10.1 inch display sporting a resolution of 1,280 by 800 pixels, a Rockchip Quad-Core RK3288C Processor clocked at 1.8GHz with option of either 2GB or 4GB of RAM on board. Asus Chromebook Flip also features 16/32GB of internal storage, a memory card reader, WiFi, Bluetooth, 2 USB ports, one micro HDMI port, and ships with Chrome OS on top of it, which relies mostly on the internet, but several Google services offer offline access so you don’t have to worry about if you’re out of internet connectivity. As far as the battery is concerned, the company touts it can offer a battery time up to nine hours, which is quite impressive, especially for those who are on-the-move most of the time. Lastly, the Chromebook measures only 262.8 x 182.4 x 15.6 mm and weighs only 0.89 KG. Head over to Asus’s website given below if you’re thinking about purchasing the new Chromebook.